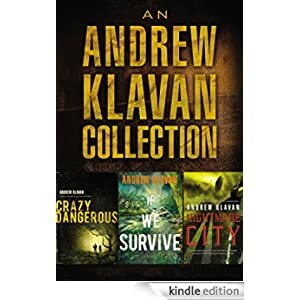 Enjoy three of Andrew Klavan’s novels as an e-book collection! Buy it today for only $2.99. Sale ends today. Crazy Dangerous: Sam Hopkins is a good kid who has fallen in with the wrong crowd. But one day, Sam sees these friends harassing an eccentric schoolmate named Jennifer. Finding the courage to face the bullies down, Sam loses a bad set of friends and acquires a very strange new one. If We Survive: High schooler Will Peterson and three friends journeyed to Central America to help rebuild a school. In a poor, secluded mountain village, they won the hearts of the local people with their energy and kindness. But in one sudden moment, everything went horribly wrong. Nightmare City: As a reporter for his high school newspaper, Tom is always on the lookout for an offbeat story. But from the moment he woke up this morning, his own life has been more bizarre than any headline could ever tell.